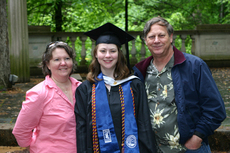 Cait's grad from Mary Washington was today, in the rain. Kyle graduates from VCU with his own shiny new bachelor's degree next week. The 'rents are soon to be empty-nesters and the Lucia sibs are done for the time being with college!